I. Hydrology. II. Hydraulics. III. Erosion and Other Destructive Phenomena. IV. Role of Forests in Water Economy and Soil Protection. V. Torrent Control. VI. Gully and Landslip Control. VII. Avalanche Control. VIII. Riparian Stands. IX. Afforestation of Barren Soil. X. Protective Forest Belts. XI. 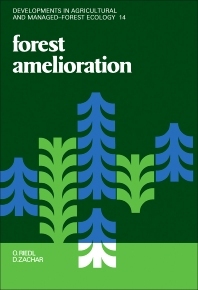 The Role of Forests in Land Reclamation and Improvement. XII. The Technology of Forest Improvement Operations. XIII. Constructions. References. Subject Index. This book is primarily addressed to workers engaged in water management and forest husbandry. It provides an overview of the problems and describes biological and engineering measures designed to improve drainage conditions in small catchment areas, protect forest land against erosion, control torrential flows, regulate the water economy of forest soils, and improve the microclimatic conditions. The thirteen chapters not only provide the reader with all the essential theoretical information, but are also supplemented by practical examples indicating solutions to typical situations. In addition, numerous diagrams and photographs are included to illustrate both theoretical considerations and the practical solutions, and several tables are added to facilitate actual computations.